This is Doris when we first got her. Doris, our lovely secondhand cat, is chronically ill. She has cat flu*. Something which is easily prevented through regular vaccinations as a kitten. However, Doris wasn’t so lucky. She was born to a rogue breeder who was looking to make money from her, rather than healthy kittens. Luckily, she was rescued by another breeder and little Doris (who was actually only 2 years old when we got her, even though she looks about sixty), is now part of the family. In a nutshell, a cat-flu cat needs a lot of work. As each cat is different, your cat may be lucky and only require occasional trips to the vet, or be like Doris, with numerous outbreaks. Unfortunately, cat flu is an illness that once gotten, cannot be gotten rid of. The only thing you can do is ‘manage’ it and hope that outbreaks are as infrequent as possible. We’ve found that the longer we leave it to take Doris to the vet’s (we had hoped she would get better quickly on her own but being an over-protective cat mum, I hate to see her in discomfort) the longer it takes for her to recover. Chuck out the Whiskas, the KiteKat, The Felix and all the rest of that crap. It’s like feeding your kids on nothing but McDonalds. Lily’s Kitchen cat food in lamb and DinDins. They go well together. Doris loves the Lamb tray version. It’s meaty (there’s no animal derivatives) and uses whole meat, grains, fruits and veg. Each ingredient is labelled (many pet food companies don’t do it), it’s all human quality ingredients (I was almost tempted) and it truly stinks – in a good way, of course. A portion of Lily’s Kitchen cat food costs approximately £1. Applaws does some great multi-pack cat tins. These are little (I normally get the 70g tins but there’s also 156g tins available too), quite watery (Doris loves the ‘juice’) and come in a wide variety of flavours. For example, Chicken Breast with Cheese, Tuna Fillet with Seaweed, Tuna Fillet with Prawn, Chicken Breast with Pumpkin and more. For a 12 pack of 70g Applaws cat food, expect to pay from £10. It’s weird thinking that your cat may benefit from supplements just like we do but it’s true, they do. 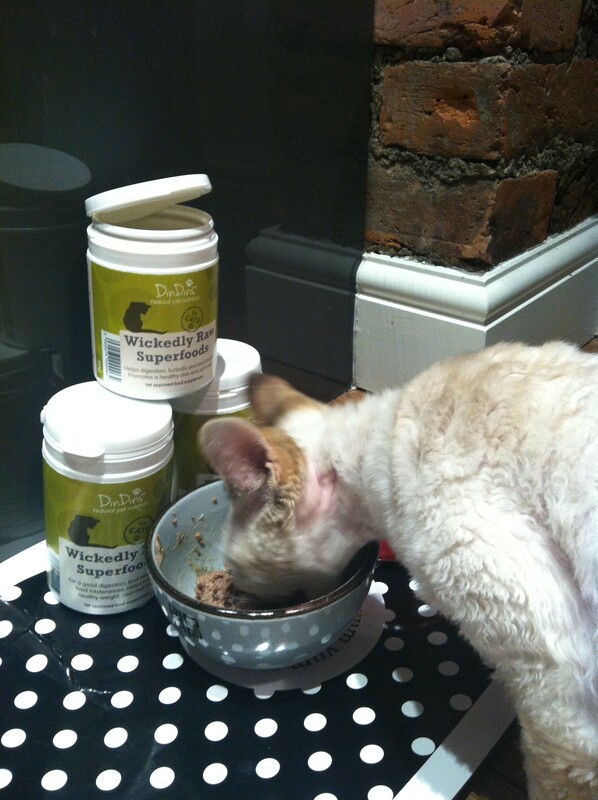 Doris munching her Lily’s Kitchen cat food, complete with DinDins. I love DinDins even more so because it’s run by two dedicated and passionate entrepreneurs. One’s a pet nutritionist (Alison Daniels) and the other (Keri Perkins) has a cat that likes nothing more than to go for an adventure – even venturing on the tube with her owner. DinDins is a supplement that you add to your pet’s normal food (they advise using high quality petfoods – ditch your Whiskas, KiteKat and Felix now!). It’s a powder of herbs, wholefoods and supergreens which are packed full of essential nutrients, antioxidants and enzymes. To be honest, it’s a little stinky, but thankfully, I’m not the one eating it! At every mealtime, I add approximately half a scoop (it comes with one) to her wet food and mix it in well. I really do believe it’s helped boost Doris’ immune system. I notice that she’s had less frequents attacks of cat flu since I started using it. It costs £13 and will last for AGES. They also have a range for dogs. Enisyl-F is a brown paste that you mix in with your cats food – 1 to 2 pumps a day for adults. It contains Lysine which helps reduce the frequency and severity of the herpes virus. Doris doesn’t seem to mind it in her food and quite happily eats whatever I put it in, which is pretty much everyday at the moment – I really don’t want her to get cat flu! One bottle of paste will last you approximately 5 weeks. The vet has some amazing things to help prevent and help make your puss feel better. For example, there’s a ‘magic’ injection our vet gives Doris which seems to quickly clear up the car flu symptoms and stave them off for about 2 weeks. Cheesy as it may sound, lots of cuddles and a sense of security will really help your cat. If your cat’s high-stress, like Doris is, then the best thing for her is to feel as relaxed as possible. If you can, make sure there’s no sudden movements when you’re around her, remove people with loud voices (especially men) and ensure your cat has a place they can hide. Cat flu is a commonly used term for an upper respiratory tract disease. Don’t worry, it’s cat-specific. Feline herpes that causes Feline Viral Rhinotracheitis (FVR). Symptoms include coughing, sneezing, a runny nose, conjunctivitis and loss of appetite. These normally last between 4 – 7 days but can also lead to secondary bacterial infections. In Doris, she has mucus-y eyes that’s often light pink in colour. Feline Calicivirus can affect the throat and lungs. When Doris has it, she gets a cough and a bit of a wheeze. Bordetella bronchiseptica affects cats in different ways and symptoms vary from mild to life-threatening. Signs of infection include fever, sneezing and discharge from the nose and eyes. Unfortunately, Bordetella can also weaken the cat’s immune system to the point where cats are left prone to catching other bacterial and viral infections. Infected dogs can transmit this onto cats. Chlamydophila felis often causes conjunctivitis in cats leading to sore eyelids and the white part of the eye. This often results in a watery to thicker yellow discharge from the eyes, as well as swelling or reddening of the conjunctiva (the conjunctiva lines the inside of the eyelid and covers the white of the eye). ** Remember that I’m not a vet, I don’t have any animal qualifications but I’m speaking from the point of view of an owner who has tried and tested many things to stabilize Doris’ illness. *** Big thank you to Marc the Vet for advising me on this point.